“No Country For Old Men’s” masterfulness lies in its sparse depiction of two men fueled by greed to find a lost satchel of money – a head to head battle with a dozen or more corpses left in their wake. But despite all the praise, “No Country For Old Men” frustrates me in almost equal measure by its unnecessarily obtuse ending that on second viewing feels even less satisfying. Tommy Lee Jones narrates the film like an omniscient observer of the events about to take place (like Sam Elliot in “The Big Lebowski” or Moses the Clockman in “Hudsucker Proxy”). He’s a sheriff with a wealth of knowledge and experience about the violent nature of man. His opening speech describes a teenage boy he sent to the electric chair without any second thoughts. The boy was made of pure evil –the Michael Myers type of evil that has no rational thought, emotion, or sanity. Our hero is Llewellyn Moss (Josh Brolin) who, while hunting in the desert, accidentally discovers a dope deal gone wrong – a half dozen dead bodies as well as a dead dog. Left over is the classic briefcase full of money - $2 million worth – enough for Moss and his shy wife, Carla (Kelly MacDonald) to retire. Moss is an intelligent character established by showing the details of his thought-process. He knows someone will eventually come looking for the money. And so, like a great chess player he calculates several moves ahead of his adversaries. But for most of the film, he doesn’t know who’s pursuing him – just a relentless force of nature – echoing footsteps in a hall, or a vacant voice on the phone. This force of nature is the evil Jones describes to us at the beginning. The Bubonic Plague with legs - Anton Chigurh (Javier Bardem). The Michael Myers (“Halloween”) comparison is appropriate not only in his actions, but also how he is shot by the Coens. He is slow, methodical and literally impossible to kill. His weapon of choice is an oxygen tank and a silenced shotgun. Like “Fargo” the Coens leave style and cleverness on the cutting room floor and tell the story with a sparse cinematic technique. The performances and characters lead the story. Josh Brolin has never been better – and to think the brothers didn’t want Brolin for the role. It took an audition tape directed by Quentin Tarantino and Robert Rodriguez to convince them to let Brolin in the door. And now, I couldn’t imagine anyone else in that role. Oscar-winner Javier Bardem’s showcase scene is his confrontation with a gas station attendant. The rhythm of dialogue is off-putting and tense. 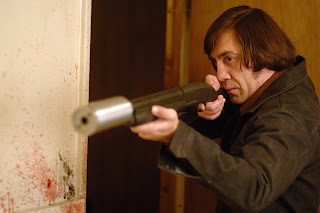 Bardem sets a new bar for sadistic maniacs. Move over Hannibal Lector – you’ve been trumped. Three quarters of the film is a quid pro quo chase through Texas and into Mexico. Like the detailed mechanics of the events in “Blood Simple” the Coens craft a series of masterful sequences of predator and prey. The piece-de-résistance of sequences – which should win the Coen’s their first directing Oscar - is a scene which starts with a hotel room confrontation between Moss and Anton and ends out on the street amid a hail of bullets and blood. But after achieving greatness for three quarters, after a key death the film slowly peters out with little action or drama that significantly affects the story. The film turns into Tommy Lee Jones’ story at the end, which still frustrates me. Though the voiceover in the film is Jones’ he is virtually inactive and doesn’t affect the plot or events in the story. The book is an anti-climax, and so is the film. The Coens, on one of the DVD featurettes, describe to us, with verve this fact. But recognizing this fact doesn’t make it any more satisfying or great. And I still hate the cut to black at the end of the film. Oh well. Enjoy.